I would love a simple midi looper (mono would be simpler, but poly would be amazing), with gate, note, velocity and maybe a few extra CC's as inputs, as well as a clock input (or start / stop), and have the same outputs too. I could be really useful for looping live midi through a load of sounds / instruments, and be able to play around with the synths while they loop (not like audio). Have you checked my pianoroll module? it can record polyphonically and play up to 8 voices. Just connect internal CV2midi modules to play polyphonic synths. I've just tried work with the pianoroll module, but I can't seem to find the "8voice2rec" submodule, or the "CV2midi" either. I can't seem to take microtuning or bends either. I was imagining something with a yellow input for clock input (fed with a high speed square lfo for high precision values) a yellow input for gate, a few blue inputs (for pitch, velocity, and touch or whatever) and a yellow "record" input (and switch) and a seq length input (and selector). on output you would have just the gate, pitch, velocity and touch. 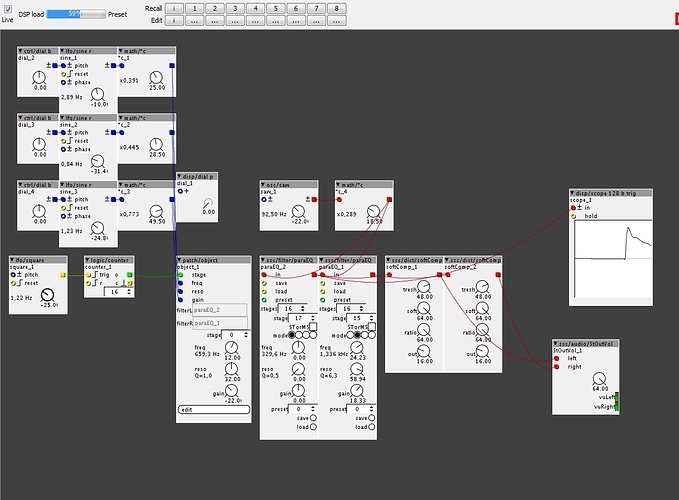 I imagine this very much as a mono sequencer, but with a lot of expression (pitch and aftertouch, and maybe more). I would love the same kind of object but that would work :), and maybe something more HD with a 24ppq resolution, where you could just chose the number of beats for the sequence. Anyway, thanks for all your great stuff, I'm still discovering old modules everyday, so much slower than it takes you to create new ones. a table allocation module to use with the guitarTableOsc and guitarTable modules. Instead of making a new table for each extra polyphonic voice, it just creates 1 table for all the voices. It has a "size" setting to set the size of each created waveform (8129 is a nice low-distortion size) and a preset setting to set how many waveform-presets can be made. Added a preset control. Now you can create multiple quitar-waveforms in a single table and select from those. added a preset control. Now you can set each (polyphonic) guitarTableOsc to read it's own guitar-waveform or just be able to select from a set of created waveforms. this module has a second wavetable that plays at a slightly different rate. The pitch is offset by a LFO that is synced to a signal connected to the sync input. The tempo-synced rate can be set in integer ratio's (M is multiply->faster, D is divide->slower). This creates extra phaseshifting. Also added a preset-selector on this module. morphs both through a scaled pitch (use scaleBank module from my harmony folder) as well as harmonic overtones. -use a triangle LFO or smoothed-out LFO to control the mix-inputs->morphs through the notes/harmonics. -noteQuant and hrmQuant set the amount of pitches/harmonics that will be played when mix goes from zero to max. -hrm/noteStep sets the stepsize of each next played note/harmonic. -noteRepeat wraps the note-count, making it repeat after the set amount of steps. For the notes, you have 2 patterns which are added together before being "ranged" between minimum (zero) and maximum (noteRange). -jump sets the offset size that will be added to the note each time the repeat wraps the count. -hrm/noteRange sets the maximum range for the harmonics/notes. -the note-pattern consists of 2 generators, so more complex patterns can be made. Don't forget to add the scaleBank module! This oscillator could be used alongside another oscillator to give it some "shine". As long as the pitch-controls are set the same and the other oscillator is using the "46scales" module to scale the incoming pitch, they both follow the same scaling.